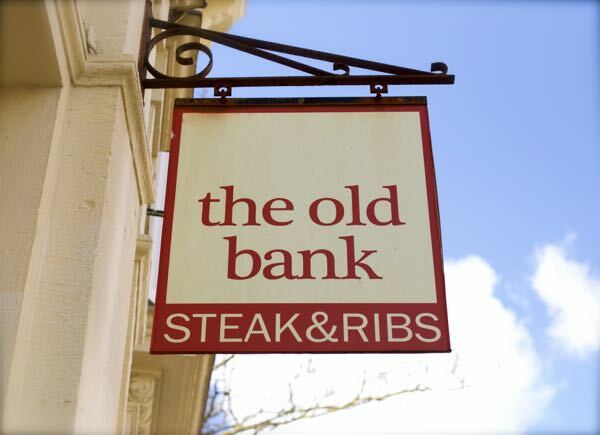 The Old Bank Steak and Rib restaurant in quirky Kemptown has been open since 2011, almost a newby compared to some stalwarts of Brighton. However, it seems to have quickly picked up the reputation of being a classic. Being an ‘Old Bank’ virgin, I thought I’d go and see for myself what all the fuss was about. I certainly heard no arguments from my husband Tommy when I suggested a Friday night steak dinner. As soon as we walked into the smart looking building, the first thing I noticed was all the smiles. Diners sat at their tables happily chatting, laughing or grinning through mouthfuls of food, the woman behind the bar flashing a big smile as she pulled a pint and the waiter coming out of the kitchen with some delicious looking food. 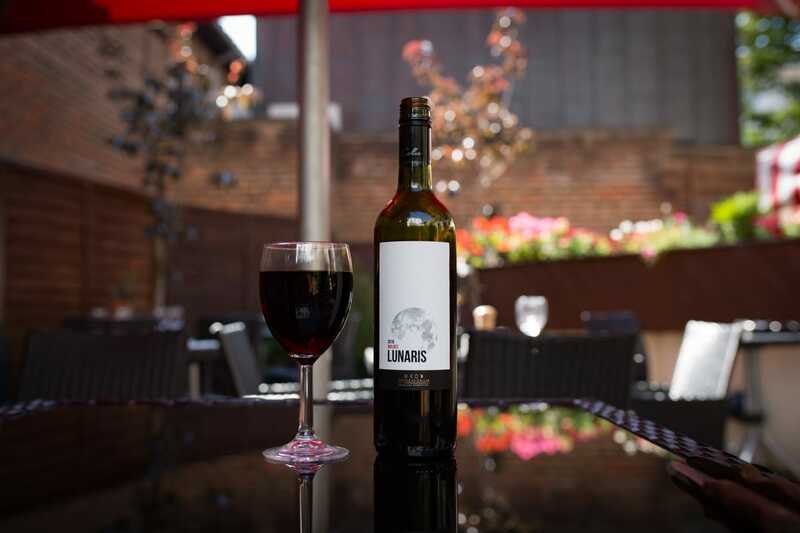 The garden terrace was situated a level below the restaurant and was centred around beautiful old tree. 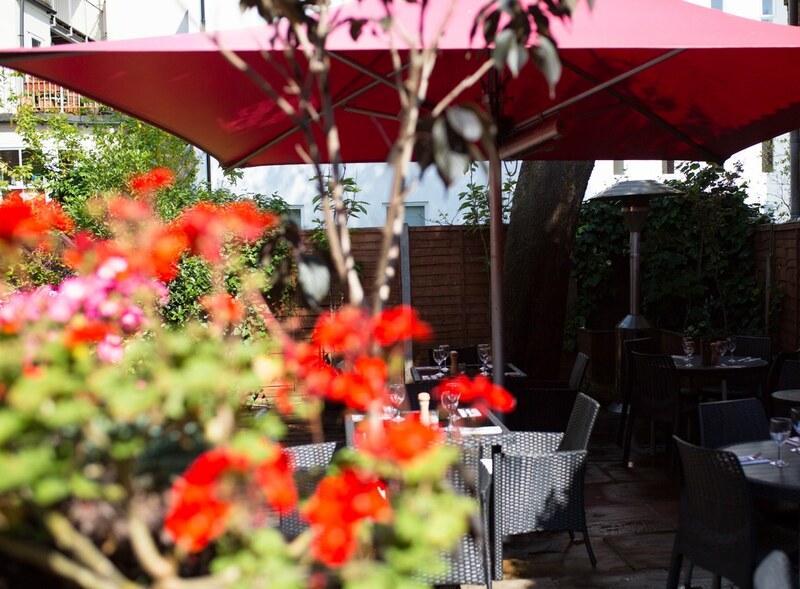 There was a massive bright red umbrella for those tables who wanted shade, and heaters for those cooler evenings. 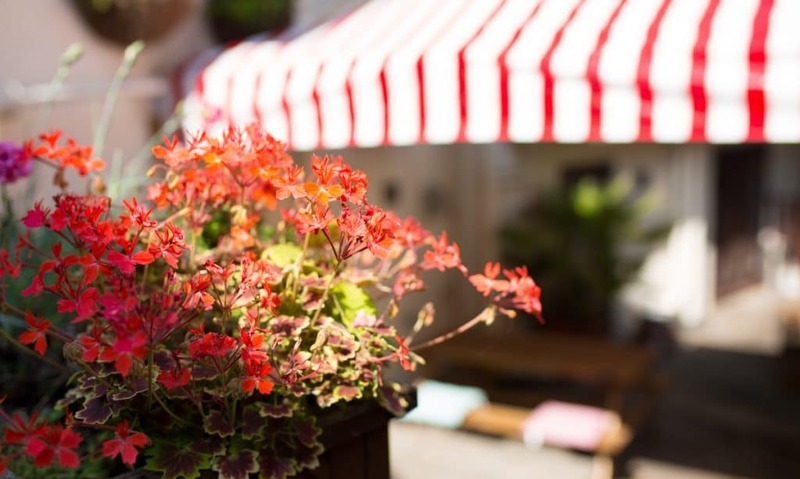 It was also lined with gorgeous blooming flower beds – fun and colourful just like the city we live in. It was surprisingly spacious and felt very peaceful. We could still hear the well chosen music from the restaurant and the slight buzz of happy diners. Feeling very relaxed we looked at the menu and chose a glass of wine each. Chilled white for me, juicy red for Tommy. So far so good. 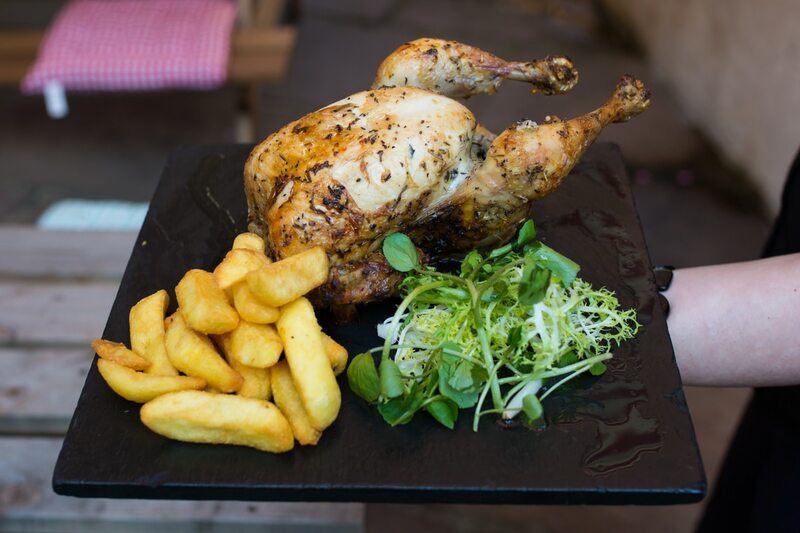 You can order a half chicken at the really affordable price of £11, or a whole chicken to share at £20. Accompaniments include chips, baked potato or a house salad and you get a choice of piri-piri, BBQ or satay sauce. I was sold. Especially as it was free-range as I’m really fussy about this, and generally wary of ordering chicken if it doesn’t specify. Tommy of course went for steak. 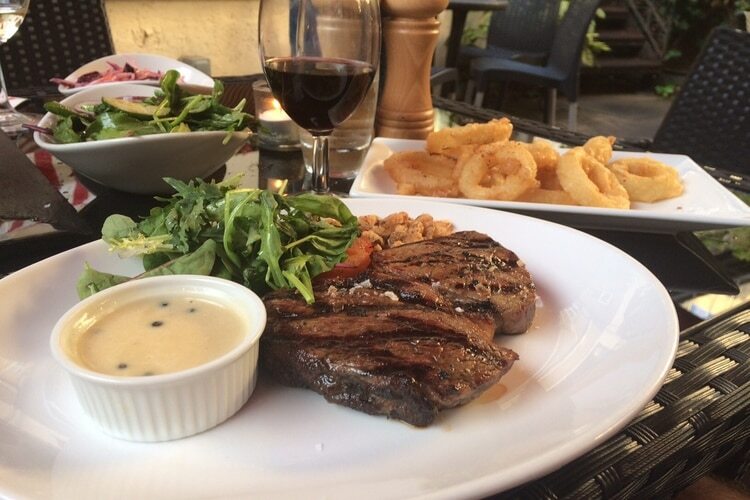 10oz Rump served with triple cooked chips and a peppercorn sauce. Both pretty hungry and wanting to celebrate another weekend, we decided to go all out and order starters too. What I liked about the Old Bank was the dishes on the menu were honest, down to earth and unfussy. They include dishes that everyone loves such as salt and pepper calamari and chicken liver pate, but also threw in the odd slightly unique ones such as the Italian Skewers of melon balls, prosciutto and mozzarella. Although, predominantly a meat focused restaurant (the clues in the name), vegetarians can eat well here too. There’s a Mozzarella Olive burger, Halloumi and Chips and Salad. Despite the fact it was summer, and had been in the high 20’s all week, Tommy still went for the seasonal soup which was Potato and Leek. I decided on the Crab Mayonnaise blended with avocado, cucumber, capers and coriander served with ciabatta. The restaurant was busy and bustling inside, and as well as us there was a family of four eating on the terrace also. Despite this the waiting staff seemed completely calm and in control, and paid us the right amount of attention. Attentive, but not overbearing. The service was also very professional. All the staff were dressed very smartly, and super polite. But at the same time, their warmth made you feel at ease and very comfortable. Whilst we were waiting for our first course, a man approached us at our table and introduced himself as Sam, a local magician who provide tricks at the Old Bank on a Friday evening. ‘Would we like to see a few tricks?’ He made it absolutely clear that there was no obligation and completely up to us. Why not? Sounded like fun to us. I couldn’t describe his tricks to you, as I genuinely have no idea how they were done! Bemused, with our mouths slightly open, he smiled and said, ‘that’s pretty much the look I aim for.’ Leaving us with a sense of confusion and wonder, as well as a souvenir – the 5 of diamonds with Tommy’s name on, which he somehow made appear in several different places; we were impressed. There every Friday evening, providing diners with a bit of free entertainment, Sam is a cool, unique addition to the restaurant. What a good idea from Old Bank. Soon after, our starters arrived. Both dishes were fresh, beautifully presented and of superb quality. 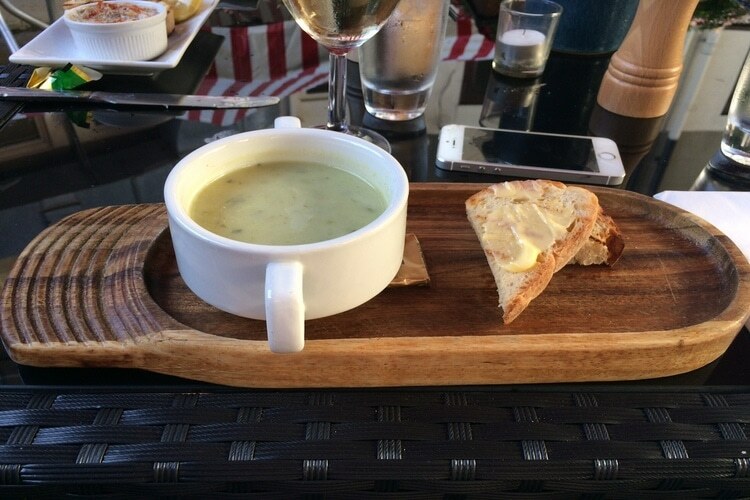 Tommy’s soup was steaming hot, creamy and flavoursome and paired with fresh, chewy brown bread. 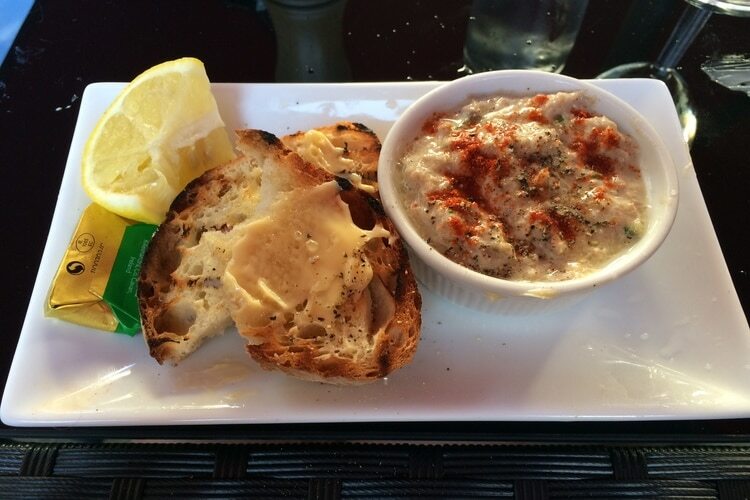 My crab mayonnaise was gorgeously fresh and zingy, and perfect with my glass of chilled chardonnay. Our tastebuds were well and truly warmed up for the main show. And what a show it was. The rotisserie chicken came out gleaming on a heavy piece of slate presented with a generous side salad, my chosen piri-piri sauce and a beautiful golden jacket potato. Half a chicken, is quite a portion! I cut into a bit of the breast and could actually hear how crispy the skin was. The flavour was amazing. Herby, salty and savoury, it was literally mouth watering. 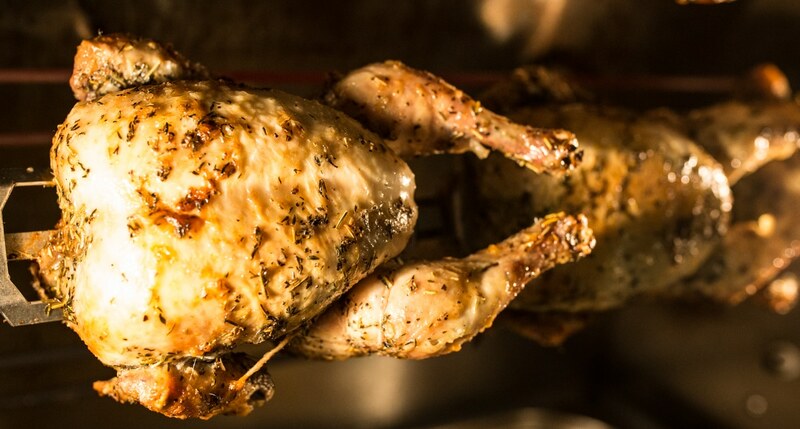 As I would expect with free range chicken cooked well, it was incredibly succulent and juicy too. If all chicken in restaurants was served like this, I certain would get excited about ordering it. With a side order of homemade red cabbage coleslaw too, I felt like I was at a really, really good barbeque. Beautiful. Tommy was as equally happy with his steak. Served with crispy onions which I thought was a nice touch, he had a side order of homemade onion rings and a generous jug of silky peppercorn sauce (our waiters favourite). 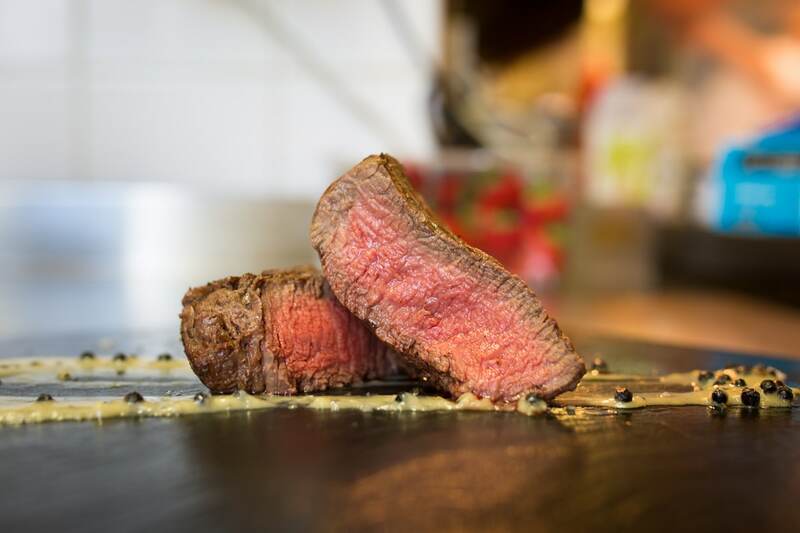 The knife cut through the steak effortlessly, cooked to a perfected pink. By the time we were finished, we felt absolutely stuffed and were smiling like everyone else. Despite our very full and satisfied bellies, we could not ignore the dessert side of the menu. In keeping with the rest of the menu, the puddings were traditional and no fuss. 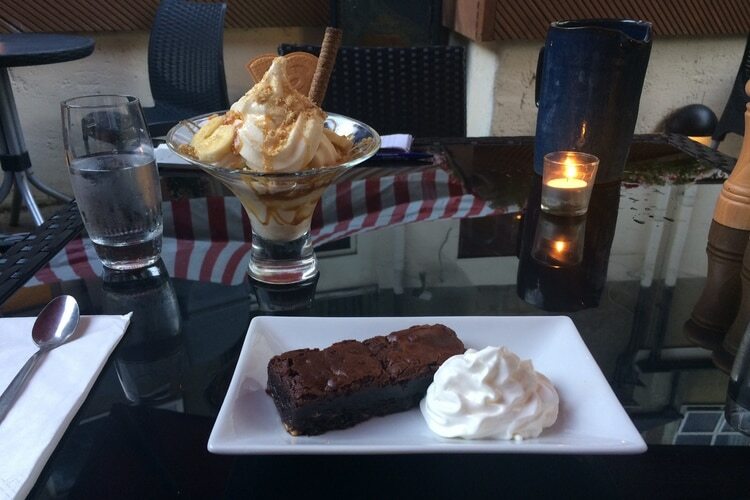 Chocolate brownie with whipped cream was the only choice for Tommy. I fancied ice cream so went for the Banoffee Sundae: crushed biscuit, toffee sauce, vanilla ice cream and sliced fresh banana. Heaven in a glass. And it was. What a great night out. 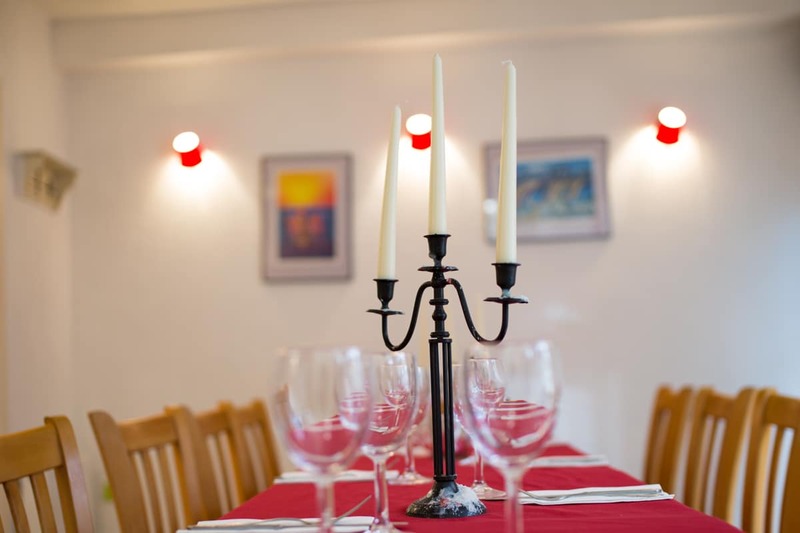 The food was stunning, the service superb and the atmosphere relaxed. We even got a bit of magic at our table. We felt very well looked after the whole evening. I would definitely go back to the Old Bank again, and now understand why it has become such a classic.